The rooster is known to be acute and they can sense things that most people cannot. They are able to think and see the smallest details to which the average person cannot perceive. The chicken knows its confidence to the point where they won’t risk doing things that they know they cannot do, otherwise, they can pretty much achieve anything they set their minds on. The rooster is a brave animal and will go far to defend their own beliefs and for people they care about. Most importantly, they are conversational so having them around can easily liven up the atmosphere. 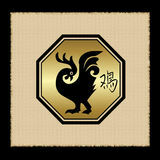 On the other hand, the rooster can be very critical that can easily offend people. They will nit-pick little details that people come short of their standards. The chicken can also be aggressive, forcing their way through others to get what they want. Most of all, they can be superficial to the point that they will only surround themselves that appeal to them.